There are many benefits of renting an apartment rather than staying in a hotel, such as having kitchen facilities, larger accommodations, more autonomy to choose what kind of place to rent and so on. If you are renting an apartment on your own account, trying to deal directly with owners advertizing on the internet or in the local press, there are a number of pitfalls to be careful of. Firstly, if you are renting in a foreign country, being able to speak the local language is important so that you are able to secure the place that you want and avoid disappointment. Also, you need to be careful of any hidden costs, such as electricity, cleaning services and other amenities: are they included in the price etc? In most cases it is recommended that you rent through an authorized agent to avoid having to manage the details that could be the difference between a vacation dream and a vacation nightmare. One sure way to secure a great vacation rental is to rent through a vacation club or through an established timeshare operator. Timeshare properties are designed to suit your needs as a visitor, and many larger resorts guarantee all the services of a hotel in addition to offering larger accommodations and the freedom that comes with renting a property. Vacation clubs give you the flexibility to choose where you want to stay with the security of receiving a quality product. 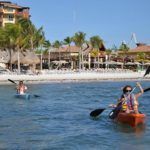 Share the post "Vacation Rentals in Mexico"